MK-2866 (GTx-024) is a selective androgen receptor modulator (SARM) with Ki of 3.8 nM, and is tissue-selective for anabolic organs. Phase 3. The most potent and tissue-selective in vivo activity of SARMs to date, with favorable pharmacokinetic properties. Kim J, et al. J Pharmacol Exp Ther, 2005, 315(1), 230-239. Duke CB, et al. J Med Chem, 2011, 54(11), 3973-3976. Regarding S1174, can you tell me if this is the (L) enantiomer, (R) enantiomer or a mixture of both? S1174 Ostarine(MK-2866) is (S) enantiomer. Darolutamide (ODM-201) is a novel androgen receptor (AR) antagonist that blocks AR nuclear translocation with Ki of 11 nM. Phase 3. 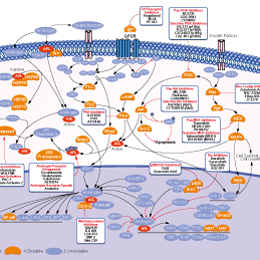 Enzalutamide (MDV3100) is an androgen-receptor (AR) antagonist with IC50 of 36 nM in LNCaP cells. Bicalutamide is an androgen receptor (AR) antagonist with IC50 of 0.16 μM in LNCaP/AR(cs)cell line. 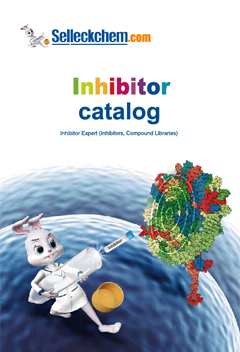 Apalutamide (ARN-509) is a selective and competitive androgen receptor inhibitor with IC50 of 16 nM in a cell-free assay, useful for prostate cancer treatment. Phase 3. Galeterone is a selective CYP17 inhibitor and androgen receptor (AR) antagonist with IC50 of 300 nM and 384 nM, respectively, and is a potent inhibitor of human prostate tumor growth. Phase 2. Flutamide is an antiandrogen drug, with its active metablolite binding at androgen receptor with Ki values of 55 nM, and primarily used to treat prostate cancer. Andarine is a selective non-steroidal androgen receptor (AR) agonist with Ki of 4 nM, tissue-selective for anabolic organs. Phase 3.